Cooks hustled around the kitchen at Cheney High School on Wednesday preparing a vegetarian lunch feast: fresh salad dressings, hot potato wedges, baked macaroni and cheese, roasted cauliflower and lentil soup. 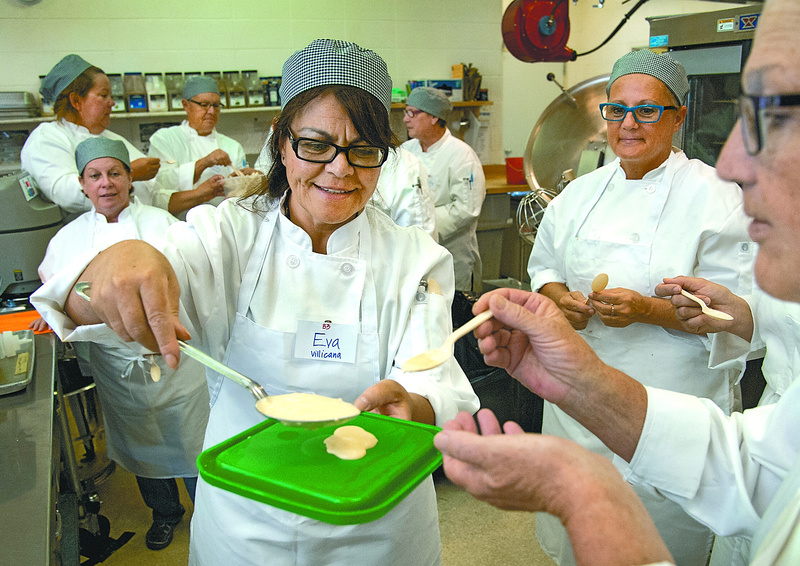 The food service workers from five small regional school districts had gathered at Cook for America’s weeklong Culinary Boot Camp where participants learn techniques to make healthy, from-scratch food at or below the same price as processed food. “We call them lunch teachers because we want to reinforce that’s what they are there to do,” said Kate Adamick, Cook for America co-founder. From-scratch cooking has been a success in the Cheney School District. Since making the switch two years ago using a grant from Empire Health Foundation, the district has seen savings in its lunch program of about $3,200 a year and a drop in obesity rates among children. And, school officials say, kids love the food. Going healthy hasn’t been as successful in many larger school districts, for reasons including the cost of new equipment, training and additional labor. Changes to the federal school lunch program inspired school districts to look at their approach to nutrition. In the past, many used quick, easy processed foods. The 2010 Healthy Hunger-Free Kids Act aimed to change that. The law requires schools to serve more fruits and vegetables, whole grains and less sodium. Many districts are saying the changes have been too expensive and students have quit eating school lunches. Districts across the nation are asking for relief. The national School Nutrition Association, which is made up of thousands of school kitchen workers, think schools should be granted waivers from the federal law because the cost of using more fruits and vegetables is too high. Many districts also report that the healthier food goes to waste, as students refuse to eat it. At Spokane Public Schools, for example, 25 percent of the fruits and vegetables served to students go into the garbage, said Doug Wordell, nutrition services director. Participation in the National School Lunch program dropped by 1.2 million students, or 3.7 percent, in the last two school years, reversing a longtime trend, according to a recent study by the United States Government Accountability Office. “State and local officials reported that the changes to lunch content and nutrition requirements, as well as other factors, influenced student participation,” the study states. Spokane Public Schools is one of eight school districts the government used in the study. The district experimented with from-scratch cooking at one school and will expand next year to the district’s Montessori school. Making a switch at all 50 schools is not possible in the near future, Wordell said. Wordell has made many changes to improve food options in the district, including using produce from local farmers, switching to whole grains and continually adding healthy recipes. Kelli Lane, a Cheney School District cook, said she thinks some school districts might be impatient about the switch to healthier foods.